In a blockbuster deal, ESPN has signed an extended agreement with the combat sports giant UFC to become the exclusive provider of UFC pay-per-view (PPV) events in the U.S., through 2025. The agreement means that if any U.S. consumer wants to pay for one of UFC’s signature events, they will need to do so through ESPN+, ESPN’s direct-to-consumer streaming service. The move maes it easy for fans to get access to UFC PPV events, while boosting ESPN+. 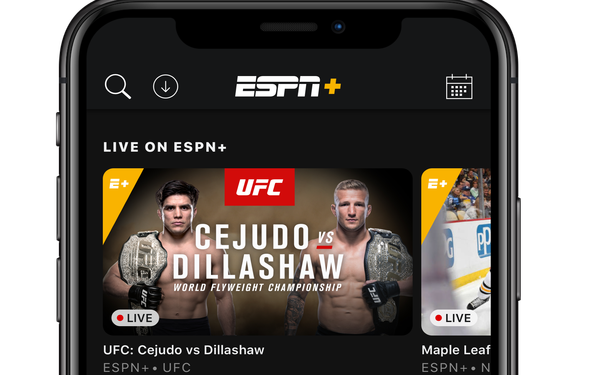 To coincide with the launch, ESPN+ will kick off a deal for new subscribers, combining one year of the streaming service and one PPV event for $79.99. Existing ESPN+ subscribers will be able to buy UFC events individually for $59.99. ESPN plans to explore additional packaging options in the months ahead. UFC, which is owned by Endeavor, will continue to sell its PPV events to commercial business, such as bars. The first PPV event offered under the new deal is “UFC 236: Holloway vs. Poirier 2,” set for next month. UFC and ESPN first struck a partnership last year, in a deal that brought a number of exclusive fights to the streaming service. It proved its value to ESPN early this year, when the first UFC fight on ESPN+ brought in more than a half a million new subscribers in a single day. The new deal will run those UFC fights free on ESPN+, but adds the company’s 12 annual signature events. Terms of the deal were not disclosed, though Sports Business Journalnoted UFC’s PPV events typically draw more than $250 million per year, with the sports organization keeping 60% of that revenue. The UFC deal underscores the degree to which Disney is willing to go to build out its direct-to-consumer offerings. While NFL games may not be exclusive to ESPN+ anytime soon, the company will pay significant sums to secure whatever rights become available.